This album was recorded in August 1966 except tracks 8 and 9 which were recorded on May 10, 1966. The Lp released in October 1966. 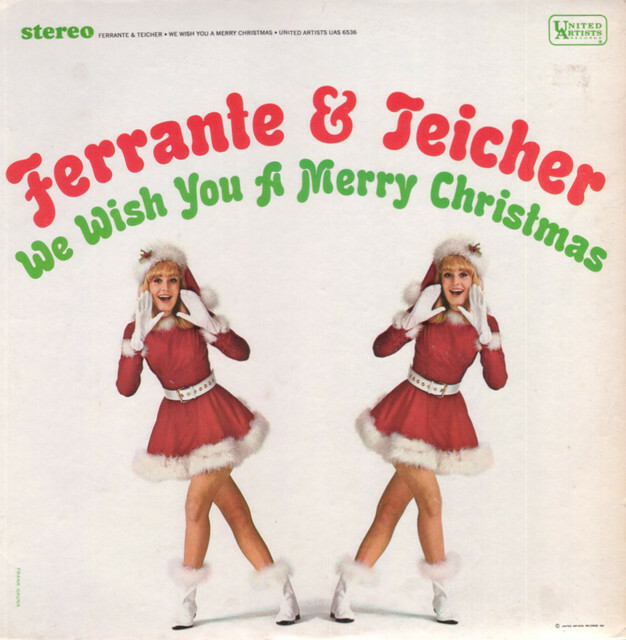 This album, "WE WISH YOU A MERRY CHRISTMAS," marks a milestone in the fabulously successful careers of the brilliant instrumentalists, FERRANTE AND TEICHER. It is their very first Yuletide collection and it has indeed been a long time in coming. Actually, it certainly can be said that "WE WISH YOU A MERRY CHRISTMAS" was recorded by popular demand. For scores upon scores of devoted fans have long been requesting holiday songs from FERRANTE AND TEICHER. "WE WISH YOU A MERRY CHRISTMAS" contains a complete program of Christmas repertoire, performed in the distinctive style that has endeared FERRANTE AND TEICHER to record buyers for so many years. The material has been artfully selected. It is imaginatively offered by a huge, soaring, string-filled orchestra lending dazzling support to the magic of our wizards of the keyboards. "WE WISH YOU A MERRY CHRISTMAS" is sometimes joyous, sometimes reverent, sometimes nostalgic. It is always appealing. It is a living Christmas card from FERRANTE AND TEICHER, sincerely bestowing upon you, the listener, their blessings for the happiest and most prosperous of holidays. Like many of the 1980s Liberty reissues, this album was available on Lp and cassette in an abridged format. They omitted "Silent Night Medley (Away In A Manger, We Wish You A Merry Christmas)" and "Rudolph, The Red-Nosed Reindeer." Fortunately, the compact disc reissues have remained intact. To the delight of F&T fans, this album was reissued as a 2-on1 CD (with Snowbound) as part of EMI's "Legendary Masters Series" in 1992. The reissue included the original album covers, back covers, new liner notes, record dates and also included United Artists logos which had been removed from reissues for more than a decade. Sadly, the CD only remained in print for a couple of holiday seasons. All of the recordings from this album were included on a remastered compilation titled Christmas Is So Special in 2000. Although I never had a problem with the sound quality of the previous CD, this one sounded better. That collection was available for several years. In 2012, Relayer Records reissued the album once again with the improved sound quality of the 2000 remastering and original artwork. The only thing missing was the recording dates, which have been reproduced above.